Description: The development of the law of obligations across the common law world has been, and continues to be, a story of unity and divergence. Its common origins continue to exert a powerful stabilising influence, carried forward by a methodology that places heavy weight on the historical foundations of legal principles. Divergence is, however, produced by numerous factors, including national and international human rights instruments, local statutory regimes, civil law influences, regional harmonisation, local circumstances and values and different political and legal cultures. 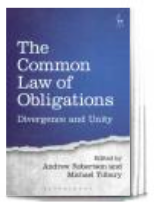 The essays in this collection explore the forces that produce divergence, the countervailing forces that generate cohesion and consistency in the common law of obligations, and the influence that the major common law jurisdictions continue to exert over one another in this area of law. The chapters in this book were originally presented at the Seventh Biennial Conference on the Law of Obligations held in Hong Kong in July 2014. A second collection, entitled Divergences in Private Law, will focus on particular departures from the common law mainstream, the causes and effects of those deviations, and the extent to which they undermine the idea of the common law as a single, transnational body of law. Description: This book is a study of doctrinal and methodological divergence in the common law of obligations. It explores particular departures from the common law mainstream, the causes and effects of those departures, and the extent to which they undermine the idea of the common law as a single, transnational body of law. 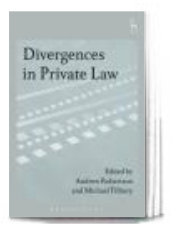 Some divergences can be justified on the basis of a need to adapt the common law of contract, torts, equity and restitution to local circumstances, or to bring them into conformity with local values. More commonly, however, doctrinal or methodological divergence simply reflects different approaches to common problems, or different views as to what justice or policy requires in particular circumstances. In some instances divergent methodologies lead to substantially the same results, while in others particular causes of action, defences, immunities or remedies recognised in one jurisdiction but not another undoubtedly produce different outcomes. Such cases raise interesting questions as to whether ultimate appellate courts should be slow to abandon principles that remain well accepted throughout the common law world, or cautious about taking a uniquely divergent path. The chapters in this book were originally presented at the Seventh Biennial Conference on the Law of Obligations held in Hong Kong in July 2014.